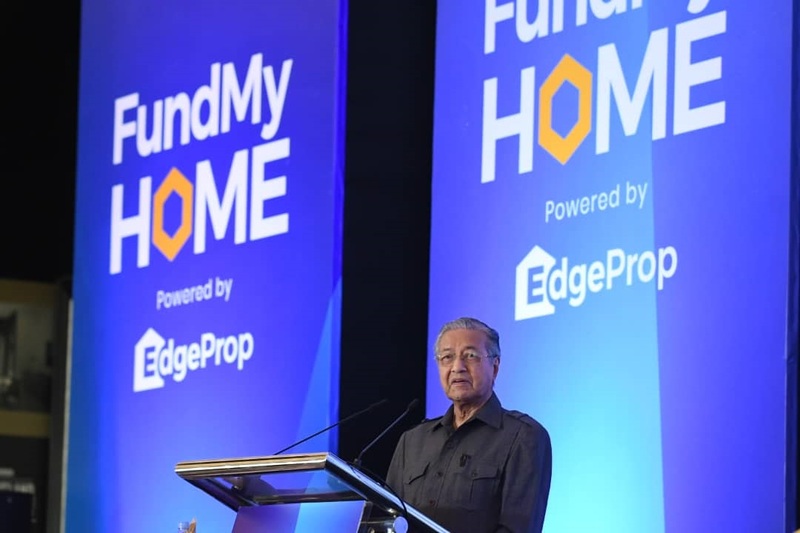 SEMENYIH (Nov 4): Prime Minister Tun Dr Mahathir Mohamad believes that the FundMyHome innovative homeownership scheme could help the government reach its one million affordable homes target within 10 years as promised by Pakatan Harapan government. He noted that houses now are too expensive for most homebuyers, thus, an innovative platform that could offer easy entry for homeowners should be encouraged. “It has been a phenomenon that there are many people who can’t afford a home due to their ability to get end-financing, while there are many completed houses left empty,” he told the audience when delivering his speech at the launch of FundMyHome scheme and FundMyHome.com platform. Developed by EdgeProp Sdn Bhd, FundMyHome.com brings together first-time homebuyers and institutions in a mutually supportive relationship, enabling first-time homebuyers to own a house through the online platform. The FundMyHome scheme enables homebuyers to purchase a home at only 20% of the property price, while the remaining amount will be contributed by institutions. Homebuyers not only own a house, but as the property's value appreciates, both homebuyers and institutions could benefit from the scheme. He said he was sceptical when the idea of the FundMyHome concept was presented to him but as FundMyHome had found the institutions and the initial buyers, it showed that the platform could be an alternative way for more people to own a home. “This is also in line with Pakatan Harapan government’s manifesto to increase homeownership,” he said. He threw a challenge to EdgeProp Sdn Bhd, the developer of FundMyHome, to prove that such a "fantastic idea" can be proven viable. "I hope and believe that this scheme could help encourage homeownership,” said Mahathir. He noted that in future, homebuyers might be able to use their money in the Employee Provident Fund (EPF) to purchase their home. “In fact, if EPF is interested they could also invest in this platform as institution investors,” he said. He also noted that owning a property could be a way to accumulate wealth as property prices appreciate time. “One of my friends purchased a low-cost house many years ago with RM25,000 and now someone offered to buy the property for RM130,000. The investment in the early years has bore fruits,” he said.